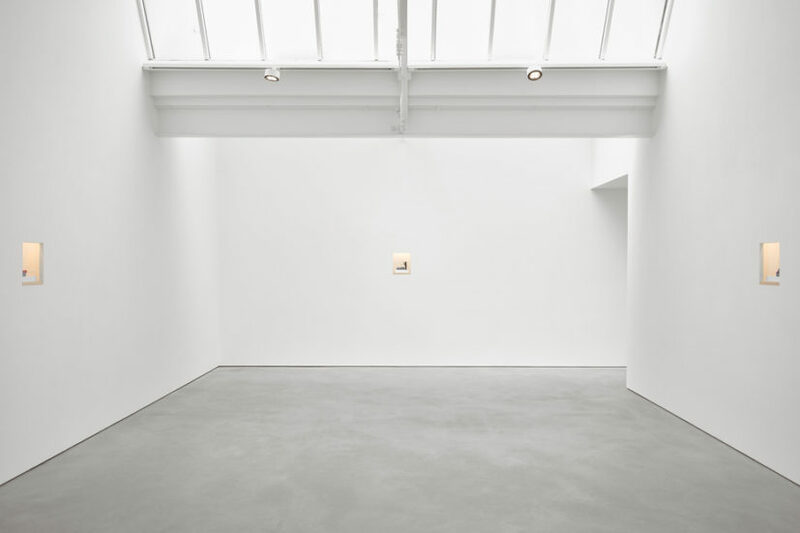 In this strong sunlight, the pure white spaces at the gallery on Helmet Row are almost ethereal. 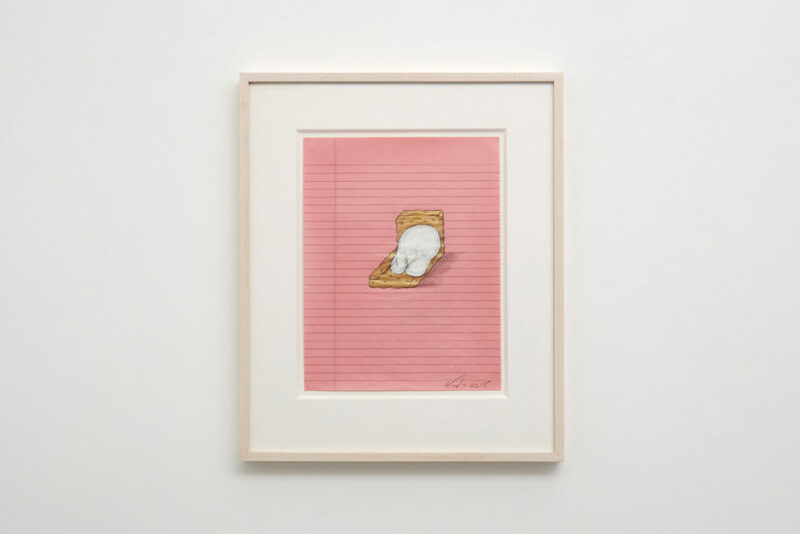 Ron Nagle’s first ever UK solo show extends over three rooms, with a small cabinet de dessins as the third space. 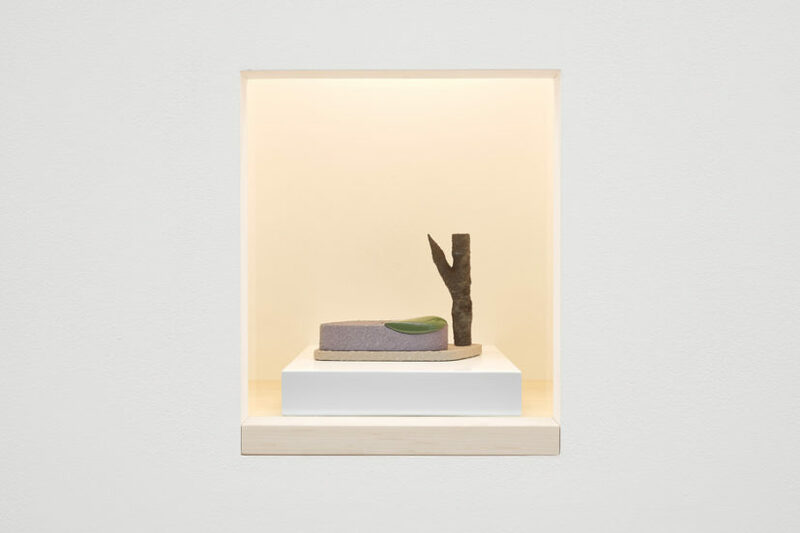 In the first gallery, one diminutive sculpture is set into a bright niche in each of the four walls. Jewel-like votive objects, each one combines hand-made abstract elements of contrasting texture and colour, arranged with a zen-like poise and balance. In the main, rear space, eleven further works of similar scale are presented under vitrines, on plinths. 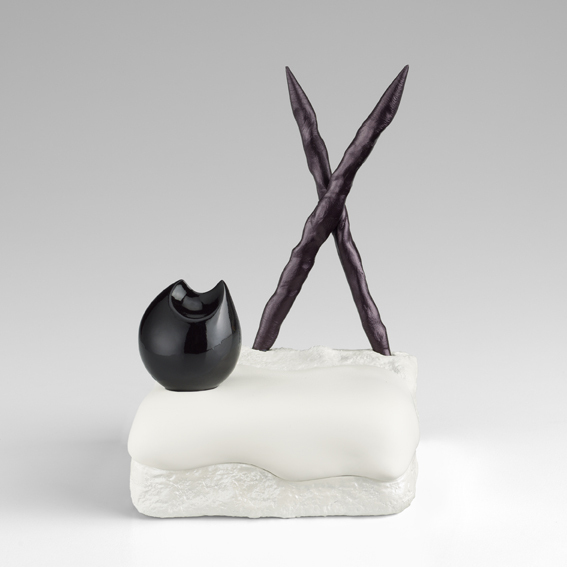 Each sculpture deploys its own miniature formal narrative, and the allusion to painting is very evident. 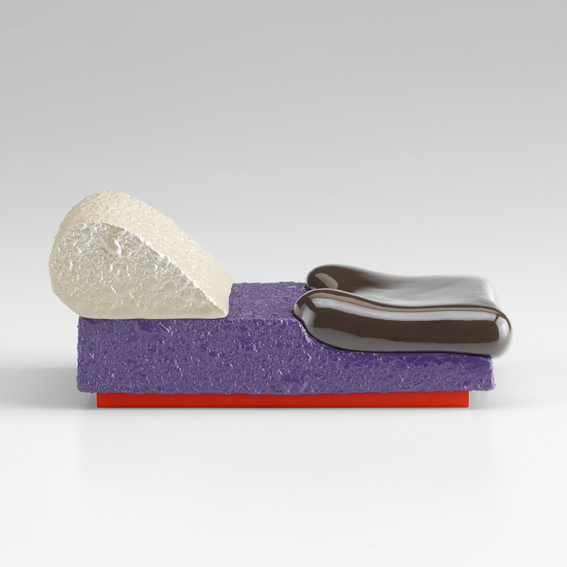 With ceramic as well as catalysed polyurethane, resins and acrylic, Nagle sets up successive framing devices and a play of textures that pits the roughness of stucco with hyper-shiny spills of painterly resin. All the works in the show have been made in the last two years. Artists’ ceramics have become rather ubiquitous in recent years – something most often explained as a reaction to our increasingly disembodied, dematerialised lives. Nagle comes out of a quite different context. He studied at San Francisco State College, worked with Peter Voulkos at University of California, Berkeley, and was part of the California Clay movement of the late 50s and early 60s. Voulkos was an extraordinarily influential ceramic artist, the first to open new territory by purposely moving away from the traditions of usable ceramic vessels, to explore clay as a purely sculptural medium. 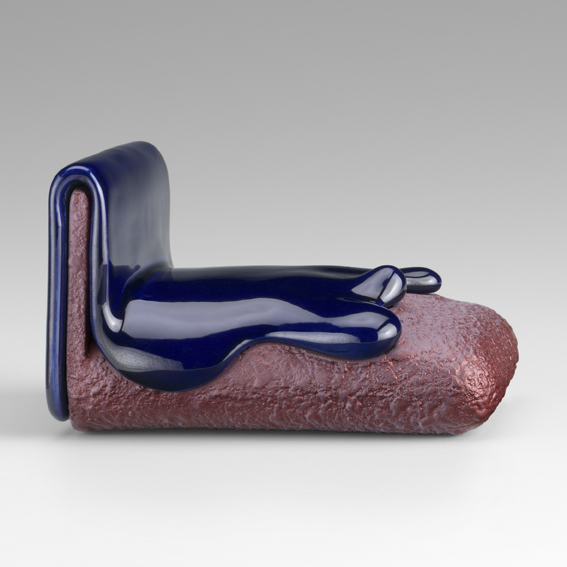 Ken Price, whose show at Hauser and Wirth London at the beginning of this year was much commented upon, was another student of his. Voulkos was a direct contemporary of the East Coast Abstract Expressionists, and as such was a conduit for an interest in psychoanalysis as well as Japanese art and culture. 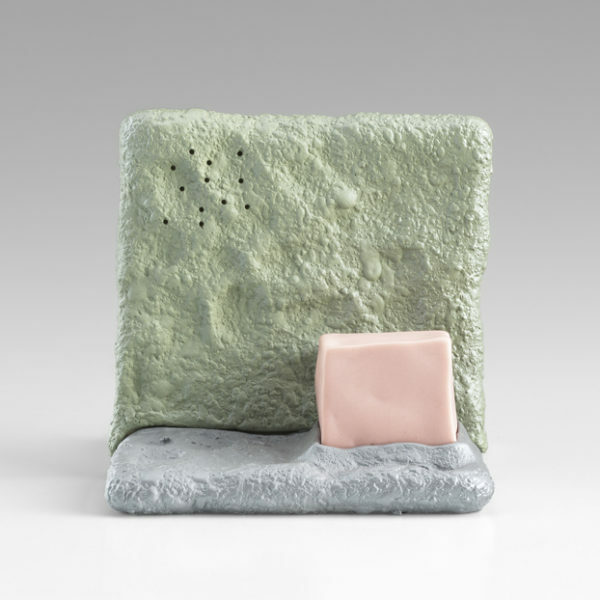 These then, are some of the aesthetic roots that underpin the work of Ron Nagle, who also cites the spirituality of still lifes by Giorgio Morandi and the painting of Phillip Guston as influences. More popular cultural enthusiasms also pervade the work. The vivid pallet of Californian hot-rods is there in the violets and brick reds, gold and lapis lazuli blues. And for anyone who has roamed the streets of Kappabashi in Tokyo, glistening plastic models of sushi also come to mind, with their nori-blacks, salmon-pinks and the acute precision in the placing of each element. “Amended testimony” is what US Attorney General Jeff Sessions was invited to submit to the Senate Judiciary Committee back in March, when senators wanted to dig in to his connections to Russian diplomats during the election campaign last year. Taking a wild guess that the Californian Ron Nagle is a fully signed up member of the West Coast elite, I read this exhibition title as his opportunity to swipe at the weasel words and miasma of corruption currently emanating from the US. Yet another sign, perhaps, of the all-pervading morbid fascination with the daily horrors of politics on both sides of the Atlantic. Nagle is in his late 70s, a life-long citizen of San Francisco and a Californian of old-school cool. A musician and songwriter as well as an artist, Nagle has a beguiling way with words, an infinitely laid-back and laconic tone that accompanies every sculpture through its title. The list of works in the exhibition could be the track list of an album: Incense Inferno, Cedric the Driver, Pontiac Fever and Yellin’ with Helen are just some examples. In contemplating abstract work the human eye instinctively goes in search of metaphor, and seeks precedents in the natural world. The frequently recurring black rods that appear in Casting Aspersions, 2016 and Yellin’ with Helen, 2016 look like asparagus spears, for example; the supernaturally velvety Dee Dee, 2016 looks like a rock specimen from some distant planet, mounted neatly on a gold base. All the works in this current show are, however, entirely self-contained. Where in previous decades, and still occasionally, Nagle riffs on the more traditional forms of cups and bottles, here the viewer has to put in the effort to explore work that is as intensely crafted as Japanese haiku. 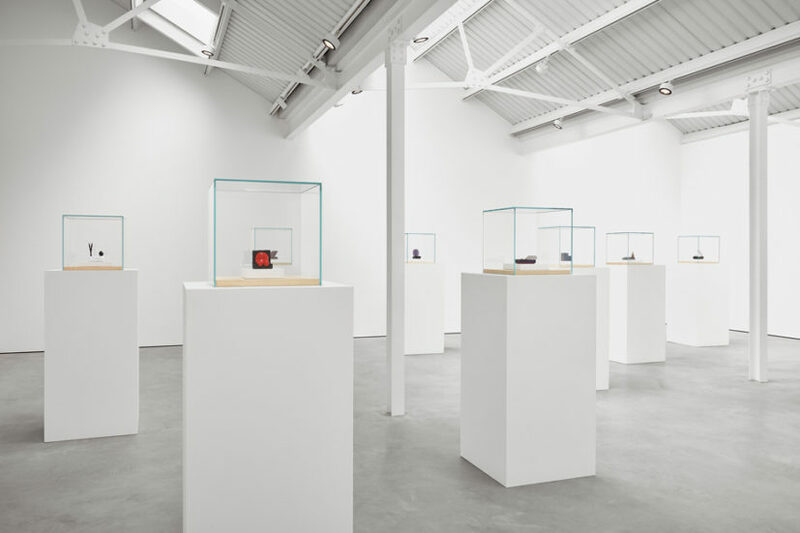 This beautifully installed exhibition offers not only a substantial introduction to an artist too little known in this country, but a chance perhaps to shake off a certain myopia about the history of the medium as an art form.